I’m much neglecting this site, and also neglecting the very film I campaigned to see! A huge massive big thank you to all involved in making this happen! Not sure how to feel about it really. I love it, but it’s certainly quite a different film. It’s going to take a little getting used to. What stuns me is just how much footage there was, and how much had been reshot by “the other guy”. It’s quite weird in places as it’s a case of watching the film you know but something is just different, and of course it’s because the same scene but shot by someone else. The test footage and bits of CGI don’t bother me at all. They work pretty well. Much of the new footage is fantastic. Some a little rough around the edges, where perhaps at the time would have been polished off had it made it into the theatrical release. Some perfect though. Everything with Brando is excellent. A sense that things are missing of course because of knowing the other version so well, but nothing really major sticks out. The ending I’m not so sure, but then I never really bought it in Superman either. It looks great though regardless. Anyway, once again, many thanks. It’s been some time since my last article on the Donner cut of Superman II, and much has happened. Warner pulled the rabbit out of the hat, managed to get Donner more involved with the project and delivered to the fans what they wanted. Well almost, but what they really wanted is really an impossibility, so we have instead the next best thing which is some huge achievement anyway and a credit to Warner, Donner and the fans. Despite the little imperfections it still sounds fantastic. More of this in Dark Horizon’s exclusive interview. 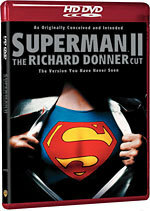 At present the new cut of Superman II will feature on an impressive 14 disc! Superman set, probably due for release prior to the release of Superman Returns featuring theatrical and director’s cuts of both Superman and Superman II, plus remasters of Superman III and IV (though there are doubts about the extended Superman IV turning up on the set), plus two cuts of Supergirl!, and plenty of extras no doubt. This set may potentially be a High Def release also (Blu-Ray and/or HD-DVD). If the rumours are to be believed, Warner Bros and Ilya Salkind have negotiated a deal to do the long desired Directors Cut of Superman II with Richard Donner’s footage, for a Special Edition DVD next year. When Richard Donner shot Superman, he was also shooting Superman II at the same time. For various reasons the shooting of Superman II was at some point delayed until the completion of Superman. However after the completion of Superman Richard Donner was promptly fired, the studio got Richard Lester in to complete the scenes Donner hadn’t, and then proceeded to reshoot a large amount of Donner’s footage just to ensure Donner didn’t get a credit on the movie. As a result of all the key Marlon Brando scenes were dumped and Gene Hackman refused to return for reshoots resulting in body doubles being used. All of this was shocking news to me as I love Superman and used to quite like Superman II although I did feel something wasn’t quite right with the second film. Now I know the truth I wondered if there was ever a chance of seeing all this missing footage. Well, it turns out there is a campaign to get Warner Brothers to release a ‘Donner Cut’ of Superman II in some form. Richard Donner has expressed some interest and so have Warner themselves to a degree. The various legal issues behind it are mostly cleared up, so it’s just down to convincing the powers that be that it’s worth the effort.